As the sun sizzles, your lawn can fizzle as maintaining it in the summer can leave a homeowner as stressed as their lawn may look and feel. To ease the experience of dealing with summer lawn maintenance, Rocky’s has provided a few helpful tips. Adjusting the height of your mower deck reduces the stress put on the grass blades. Most grass types prefer to be mowed high, so set your blade at one of the highest settings on your mower during the summer. It’s recommended you follow the one-third rule–only cutting the top one-third of the blade of grass, which reduces the chances of the lawn burning. Taller grass grows deeper roots, which can reach moisture that is further down in the soil. Also, make sure your mower blades are sharp. Dull mower blades shred grass, which causes the grass to lose more moisture than clean cut grass. Shredded grass tips turn brown, making the lawn look dull. Dehydration can turn a lush lawn into a brown patch in no time. Signs of dehydration can be spotted by curling grass blades, a bluish-green color and foot-printing, where you can see your footprints in the grass after it’s walked upon. Most lawns need about one inch of water per week during the summer. TIP: Mark one inch from the bottom of several plastic containers scattered on your lawn during watering and clock how long it takes to reach the one-inch mark on the containers. This will be your time reference for how long you should water to provide ample hydration. Locate a brown patch and pull on the grass. If it doesn’t pull up easily from the soil and is firmly rooted, it’s likely brown due to drought. Push a screwdriver into the soil in brown and green lawn areas. If the screwdriver slides easily into the green lawn and won’t penetrate brown, the soil is dry. Inspect the lawn as a whole. When drought is in effect, brown patches will appear randomly and in rough patterns. Lawn near a sprinkler head may be green, while lawn further away is brown. Grassy areas in shade remain greener when parts in sun turn brown. 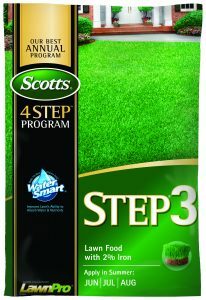 Scotts® Step® 3 Summer Stress is your answer to drought. Applied to wet or dry lawns, Step 3 can be perfect to deliver a great green-up for your lawn, strengthening your blades against heat and drought. Make sure you feed every 6–8 weeks for best results. Our lawn schedule will help you plan application of all your Scotts lawn products, so be sure to grab a copy while shopping at our Northeast locations.